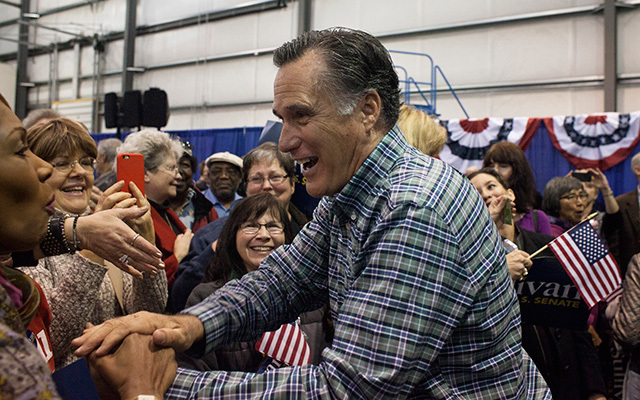 After first denying he would seek the presidency again, then hinting he was still interested, Mitt Romney now has begun reassembling his campaign team for an “almost certain” third presidential bid. But if Romney — who, you’ll recall, lost the Republican presidential nomination in 2008 and then won it four years later, only to lose in the general election to Barack Obama — does decide to make yet another run, he would be challenging more than just Bush, Chris Christie, Rand Paul and the host of other Republicans eyeballing 2016. As Fact Tank first wrote back in October, Romney also would need to overcome the weight of history: In the U.S., the two major political parties seldom give their failed presidential nominees another shot at the brass ring. With the help of the National Archives, we looked at every major-party nominee in every U.S. presidential election since 1800, when the two-party system began to resemble something close to its current form. In all that time, only nine candidates who received their party’s nod once and then lost the presidential election have succeeded in getting nominated for the presidency a second time. (That tally doesn’t include third-party nominations, such as Ross Perot in 1992 and 1996.) And only four of those candidates actually won the presidency on their subsequent try — the most recent being Richard Nixon, who lost to John F. Kennedy in 1960 but won both the GOP nomination and the White House in 1968. Since then, only two former major-party nominees have even made serious attempts to get nominated again. In 1972, Hubert Humphrey (who had lost to Nixon four years earlier) sought the Democratic nomination but lost to George McGovern. Twelve years later, McGovern himself made a short-lived bid for the Democratic nomination, losing to Walter Mondale. It wasn’t always thus. In the earlier decades of the Republic, many of the same names kept cropping up as presidential or vice-presidential nominees. The Federalist Party, in fact, nominated the exact same ticket (Charles C. Pinckney and Rufus King) in both 1804 and 1808, though they lost both times. Henry Clay stood as the National Republican nominee in 1832 and as the candidate for its successor, the Whig Party, in 1844. Democrat Grover Cleveland is a special case: He managed to come back after losing his 1888 reelection bid, regaining the White House for a second nonconsecutive term in 1892. 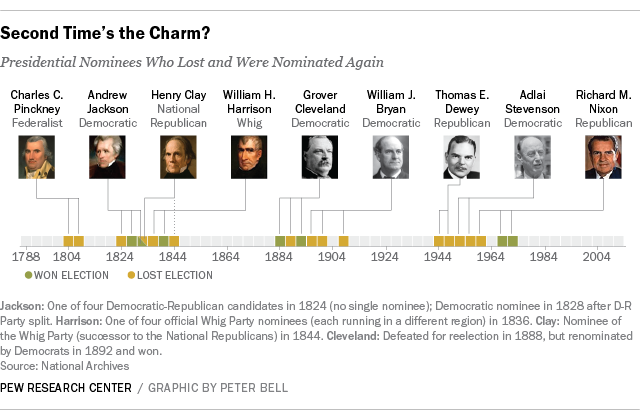 And William Jennings Bryan was the Democratic nominee in 1896, 1900 and 1908 — losing each time. More recently, though, the Democratic and Republican parties seem to have operated on the principle that after one chance in the general election, candidates should make way for new (or at least new-ish) faces. Note: This post was originally published on October 15, 2014, and updated on January 13, 2015.